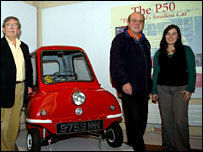 The world's smallest roadworthy car, the Manx-made P50, has been put on display in the Peel Town Gallery. The tiny car is on loan from the transport museum, which is closed from September until Easter. This car was the brainchild of local designers Cyril Cannell and Henry Kissack and made by Peel Engineering. The car is under a metre wide and 1.2m high and was marketed as "almost cheaper than walking" as it does 100 miles per gallon. 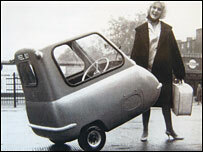 It was first launched at the motor show in Earl's Court in 1962 and sold for between £179 and £199. Chris Machin, chairman of the Manx Transport Museum, said: "The Manx Transport Museum is closed from the end of September until Easter and it was thought that the P50 was far too interesting an exhibit to be locked away in storage throughout the winter." The car was recently featured on an episode of the BBC Two programme Top Gear. Audiences saw presenter Jeremy Clarkson drive the car around the corridors of television centre in London and even into a lift. Aimed at urban use for one person and one shopping bag, it was said to be "a dream" to park. There was no reverse gear, instead a chrome handle was fitted to the back of the car and weighing only 130lbs it was easy enough to pick up and just turn round. Peel Engineering ceased trading in 1974 and only 200 of the cars were made. This P50 will remain on display in the Peel Town Gallery at the House of Manannan until Easter 2008, when it will return its home in the Manx Transport Museum.